This is the story of a book. Perhaps the most remarkable book ever to come out of the great publishing corporations of Ursa Minor. Sorry, Douglas Adams. I couldn’t resist. Don’t panic. Let’s start again. The hardest thing to learn about improv is how simple it can be. The Tao of Improv is simply about simplicity. That’s why it’s only about 100 pages long. I believe that there are important lessons in life that can lead to better improv scenes (and important lessons in improv that can lead to a better life). The Tao of Improv can improve the way we function and interact — onstage and off. 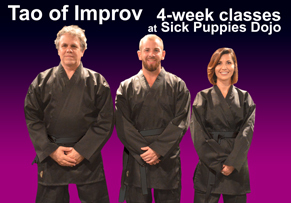 The Tao of Improv is not a compendium of every improv game, format or term that has ever been invented. There are other resources available to you if you need that information. Excerpts from the Tao Te Ching are woven into the improv philosophy. But there’s nothing mystical about it. The Tao of Improv provides a concrete platform from which to understand one’s place on an improv stage. Once you know why you’re on the stage, you’ll know what to do when you’re there.